As individuals, life is full of challenges. Often as we go along, one needs anchors off and on to help cope or to boost oneself. Substance abuse among children has become a worldwide public health concern as it is affecting the early youth and subsequently the whole life of individuals, and has demonstrated a gradual increase over the past few years. It is a complex problem because there are so many reasons why people fall into this addiction in the first place. Unless all these reasons are considered, it is quite an uphill task to effectively tackle the problem. Smoking is perhaps the most popular and one of the best ways of getting foreign substance into our bloodstreams. In its milder form, with tobacco it is seen as more of a milder social activity, whereas marijuana, hashish etc. are considered to be up-market party-circuit drugs and often smoked to with friends to demonstrate raw machismo. Often started as a status symbol and under peer pressure among the youngsters, smoking paves its way as an addiction in their life. Addiction is a term used to describe maladaptive drug-seeking behavior, even after knowing the negative consequences of the drug. The various combustible forms of tobacco products today are cigarettes, hookah, bidis, chewing tobacco, ground and powdered form. The discovery and cultivation of nicotina tabacum dates back to 6000 B.C. Since then, people have been found to indulge in smoking or chewing the leaves of the plant. In the beginning, the plant was believed to have medicinal properties, which protected against the ravages of bubonic plague, widespread in the Middle Ages. Soon after, there arose speculations regarding the link of cancer and use of tobacco. These speculations have been proved and evidence has been provided by modern research methods. Along with thousands of other chemicals found in the tobacco plant, a chemical substance, called nicotine that keeps its users addicted is also present. Five percent (by weight) of the tobacco plant is nicotine, a naturally occurring liquid alkaloid. An organic compound, alkaloid is made of carbon, nitrogen, hydrogen and oxygen. A cigarette typically contains 10-20 milligrams of nicotine; 1-2 milligrams get absorbed by the body while smoking. From the moment you inhale the smoke, in about 10 seconds, nicotine is absorbed through the skin, mucosal linings in the nose, lungs and mouth. In 4 seconds it reaches the blood stream to reach the brain in another 7 seconds. Thus, adrenal glands are stimulated to produce a hormone and neurotransmitter, called epinephrine. The hormone, while constricting the blood vessels increases the heart rate and blood pressure. One might have often heard from people that smoking alleviates anxiety, depression and gives them pleasure. This is majorly because of the production of dopamine, a neurotransmitter that controls the brain’s pleasure center. Production of dopamine is stimulated by epinephrine. Smoking is widely used to inhale nicotine as it gives the most immediate effect. The lung of a human being is lined with millions of tiny air sacs called alveoli. Alveoli provide a surface area more than 40 times the surface area of your skin. Thus, inhaling is the most efficient way to get nicotine into your bloodstream. Once absorbed by the body, enzymes in the liver break down about 80 percent of the nicotine and is metabolized into cotinine and nicotine oxide. Cotinine and other metabolites are excreted in urine; detected in blood, hair and saliva. Cotinine has a half-life of 16- hour, and it is this metabolite that is detected in the urine screening test. It has been reported that the smokers get a sense of well-being, as it tranquillize anxiety and pain, supposedly. But, it has been found that nicotine affects the metabolism of the body. Reduction in appetite, accelerated metabolic rate, increase in blood pressure and heart rate, constriction of arteries and excessive sweating are ill effects of smoking, to name a few. 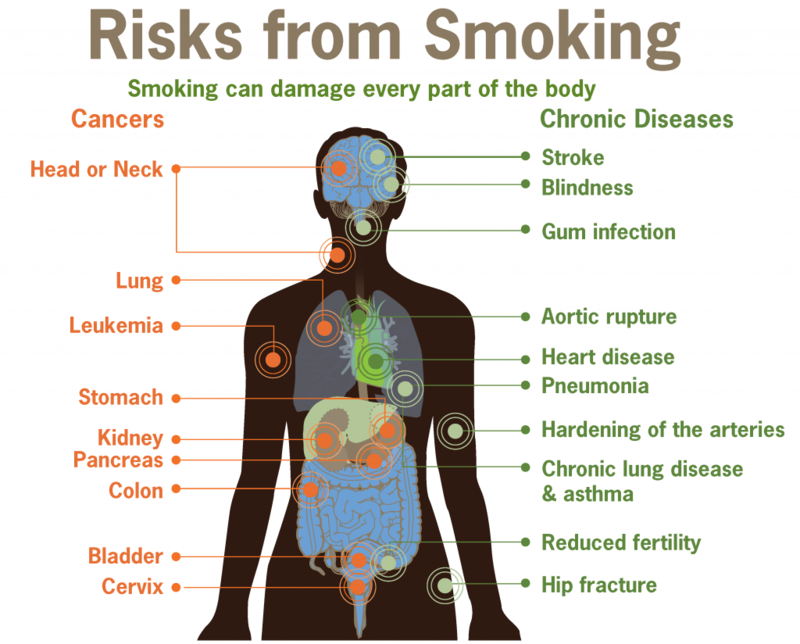 According to statistical findings, exposure to tobacco smoke causes about 4,80,000 premature deaths each year in United States of America. Of these deaths, 36 percent are from cancer, 39 percent from heart disease and stroke, and 24 percent from lung disease. That is literally a gross number! How it affects the non-smokers? Second hand smoke, also called passive smoking or involuntary smoking, is the combination of smoke given off during the burning of a tobacco product and the smoke exhaled by a smoker. It has been classified as a known human carcinogen (cancer causing agent) by The U.S National Toxicology program. Inhalation of secondhand smoke has led to lung cancer in non-smoking adults. Living with a smoker increases the chances of lung diseases by 20 to 30 percent amongst the non-smokers, as reported by the U.S. Surgeon general. Smoking is a habit, people find hard to quit. But, cigarette smoke contains chemicals like arsenic (found in rat poisons), acetic acid (found in hair dye developer), ammonia (found in household cleaners), carbon monoxide (found in car fumes), hydrazine and methanol (both found in rocket fuel), tar (found in roads). We might just want to think twice before enjoying another smoke session. Ohh..very well explained…good going..keep up the spirit..